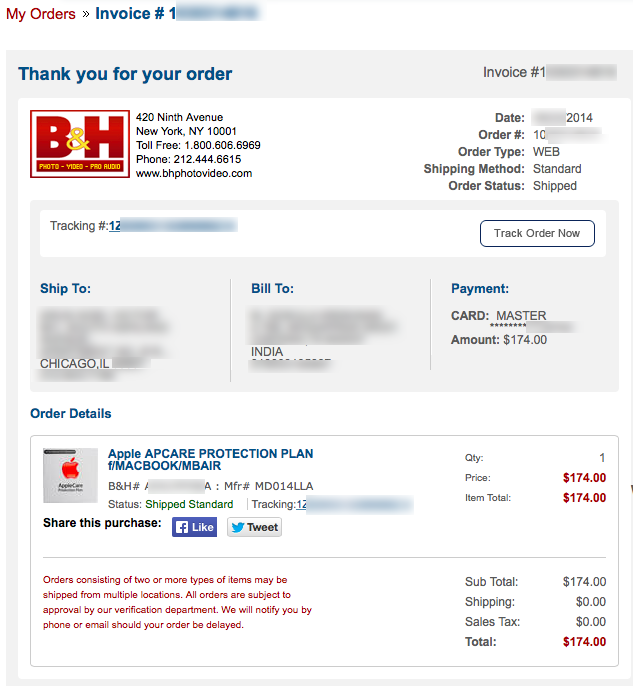 My real confusion about buying AppleCare was because of price. AppleCare in India costs INR 15,500 ($249) – Standard US price. While you can get solid $75 discount from US Vendors such as Amazon.com and B&H, there is NO such discounts in India. If you are lucky, you can get INR 14,500 from Snapdeal and save 1000 bucks. Since Macbook is covered in Apple’s Worldwide Service, I was wondering why not buy AppleCare directly from US Merchants and apply to my (Indian) Macbook. I was skeptical about it because there were NO clear statement whether it will work or not. If it doesn’t work, my friend has to ship it back(from Chicago to NY) at a cost and also arrange INR 15,500 to buy in India (since it takes 10 to 15 days to get refund. My warranty expires in 4 days). With limited time in my hand, I went ahead and purchased it from B&H, since the price was fluctuating in Amazon.com & went to $219. P.S 1 : It is advised to keep AppleCare box and bill safe. There are few incidents where people sell illegal AppleCare registration number on eBay and other sites. In such case, service and support will be blocked unless you provide a bill from Authorised Resellers. P.S 3 : I used MasterCard and got very less forex charge. I was charged INR 10,508 which was quite good (1 USD = 60.39 INR and it was pretty close with XE.COM ). I have another VISA and use it to pay for my server every month. It always had extra +3 INR per USD. P.S 4 : For Indian iPhone, it is better to buy AppleCare locally as there is no International warranty. Many phone parts are only available in there country where it is sold. Any queries, contact me. I will be happy to help. Update: Working with Amazon as well.